The DUBO-toothed collar ring is a unique addition to the DUBO-retaining ring, and is intended for use in combination with high quality steel nuts (8.8). It will now be possible to admit any desired bolt tension without damaging the DUBO-retaining ring on account of high bolt and nut loads, this design permits the use of any nut as a locking nut, which can be re-used. By putting the DUBO-retaining ring into this toothed-collar ring, optimum deformation of the DUBO-ring is obtained after tightening the nut. The deformation of the DUBO-ring causes the locking and tightening effect according to the DUBO principle. At the spots where the teeth have been provided, the DUBO-retaining ring is perforated under high pressure and after complete deformation, constitutes unity between toothed collar ring and nut. When this situation is obtained, the nut to be locked has come into contact with the steel teeth. From this moment on, every desired bolt pressure can be admitted; in fact a partly rigid connection between steel on steel and nylon is obtained. 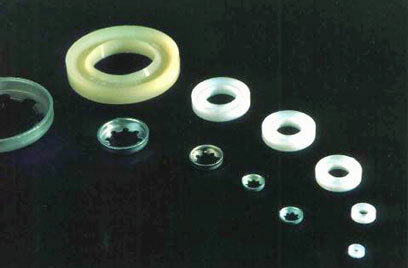 Due to the fact that the DUBO-ring is compressed under high pressure between the teeth of the collar ring, a constant elastic action is obtained. 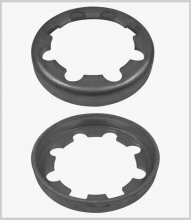 DUBO-toothed collar rings can only be used in conjunction with DUBO-retaining rings. Patented throughout the world. Increases the application for screws from 8.8.